April is all about product feeds! 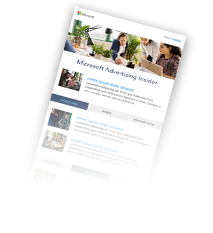 Bing Ads has released several great features to help you improve your business through enhanced feed management and optimization for Bing Shopping Campaigns. With the online inventory update feed, you can send us price and availability updates as they happen. To give you much-needed flexibility in managing your feed updates, we’ve added scheduling to automatic feed downloads. Last but not least, you now have more insights to optimize your product titles using the new offer-level search term report. For product attributes that you update frequently, like price, availability and sale price, you can easily make updates using the online product inventory update feed. This will help you keep your product information fresh at all times. You’ll continue to use the main product feed to submit product data offers at least every 30 days. With this new feed, you can reduce the processing time for frequently changing attributes. Also, feed management is easier because you’ll be sending updates only for product offers that are changing. You can submit the online product inventory update feed via FTP or manually from Bing Merchant Center. You also have the flexibility in deciding if you want to update price, availability or both. Just send us the appropriate data, and we’ll update it for you. You can find in-depth details about the feed and see samples in our Bing Ads Help center. Start sending us update feeds, and have the latest data available for searchers in no time. Automatic feed download is a hassle-free way to submit product data to Bing Merchant Center. We’ve made it even more flexible by providing a scheduling capability so you can have us download the product feed at whatever time works best for you. You have several scheduling frequency options to choose from: daily, weekly or monthly. All these options can be found along with the automatic download setting in Bing Merchant Center. Read the detailed walkthrough on how to set a schedule, and see the schedule settings below. Once a schedule has been set, Bing Merchant Center will download the feed, process it and have it ready to be shown on Bing Ads. So, go ahead and set schedules for the feed and take the worry out of managing feeds. To provide you with the utmost visibility into which queries get matched to which products, we’re very happy to introduce the search term report at the product offer level. Just as the name suggests, this report provides you with exact queries that triggered your Product Ads at the item ID level. Easily pinpoint which queries are resulting in untargeted visitors and higher costs, and the products that are being mapped to them. Optimize your product titles. After ensuring that you’re submitting a clean feed, the second most important optimization that you can do is ensure that the titles of your products are relevant to the search queries. Product titles are among the most important factors influencing the performance of your campaign, and sometimes simple but informed changes to the titles can have a significant impact on your overall performance. Example: If you’re selling personalized photo frames and you notice seasonal surges in search queries (for example, with Mother’s Day approaching, you could see a surge in queries like Mother’s Day gifts, Mother’s Day photo frames), it would be beneficial for you to experiment with adding the occasion in front of the product title and change it seasonally to match what customers are searching for. We're always looking for feedback on how we can improve Bing Shopping Campaigns to help you do more and work less. We invite you to contact us via Twitter, suggest a feature on the Bing Ads Feature Suggestion Forum, or send us an email with your thoughts to bingads-feedback@microsoft.com.